I’d eat pasta everyday if my waist line allowed. There is something about pasta tossed in a creamy sauce that just warms my soul. Luckily as fall rolls around we are blessed with all the spaghetti squash I can get my hands on. Vegetables that are a great pasta substitute? Sign me up. Not only does cooked spaghetti squash resemble pasta but it adds a crunchy rich flavor to your dishes. Spaghetti and meatballs of any form are a staple in our house during the fall. From turkey to lamb I make meatballs from any meat. Here’s my recipe for an easy weekend night meal! Add the ground chicken, breadcrumbs, egg, pinch of salt and pepper and Italian seasoning to a bowl. 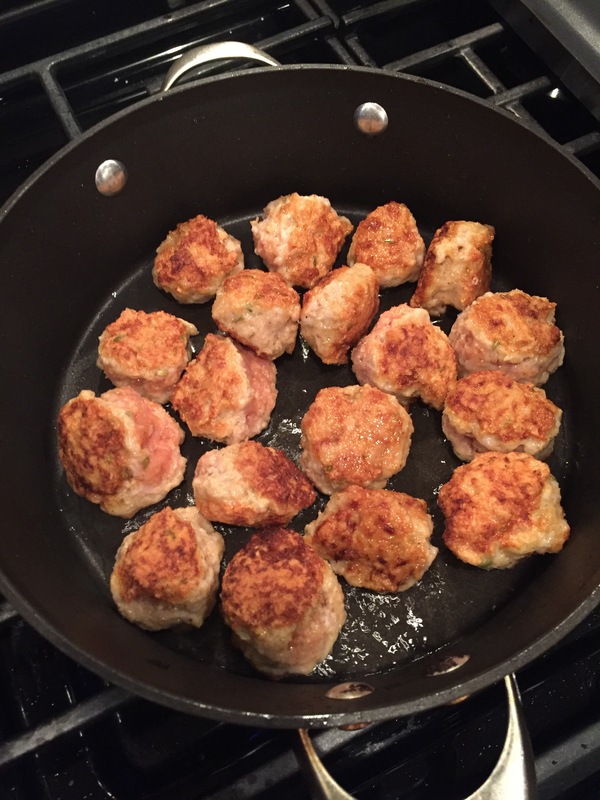 Mix gently and form meatballs of the your desired size. I like mine about the size of a ping pong ball. Add the meatballs in batches to a skillet with olive oil (or any other type of oil you have on hand) and brown on all sides then transfer to plate. This will not cook the meatballs all the way through. 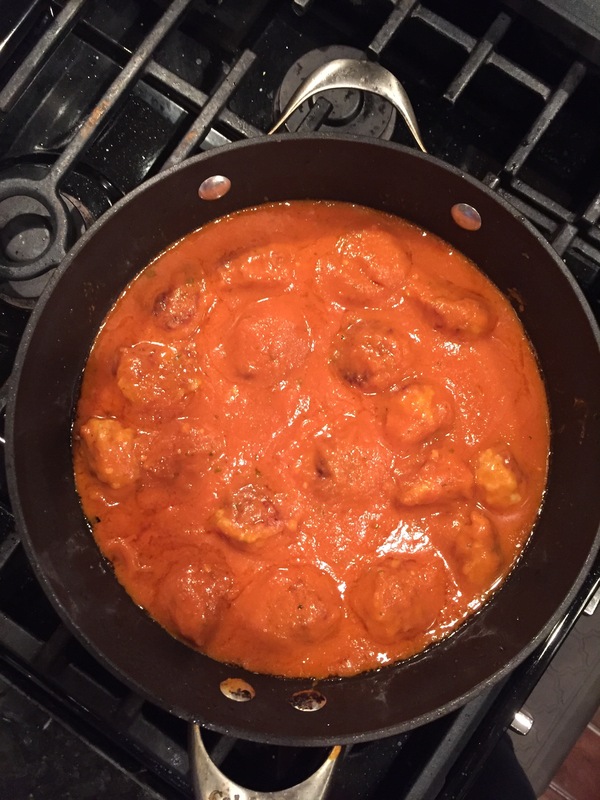 Add all the meatballs back into the skillet and add a jar of your favorite pasta sauce. Turn heat down to simmer/low and cover. 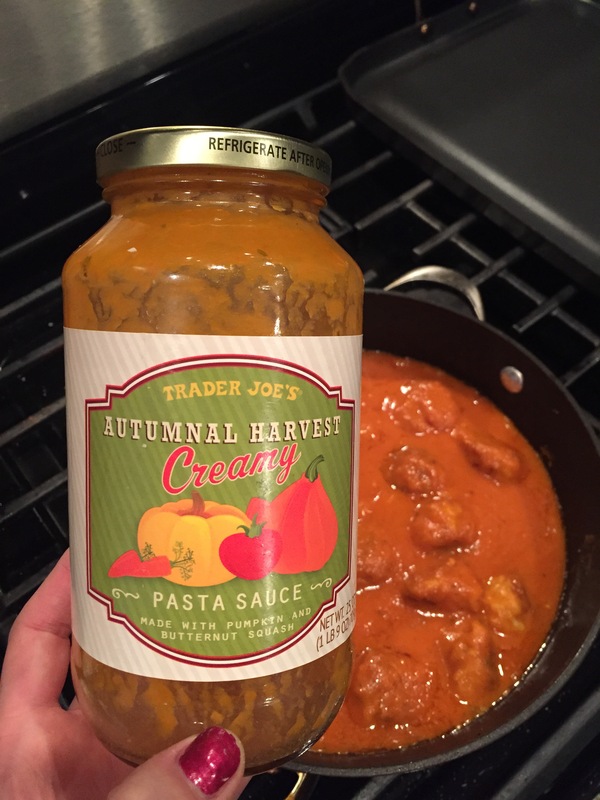 I love the flavors in this Trader Joe’s pasta sauce – they are a perfect pair with spaghetti squash. 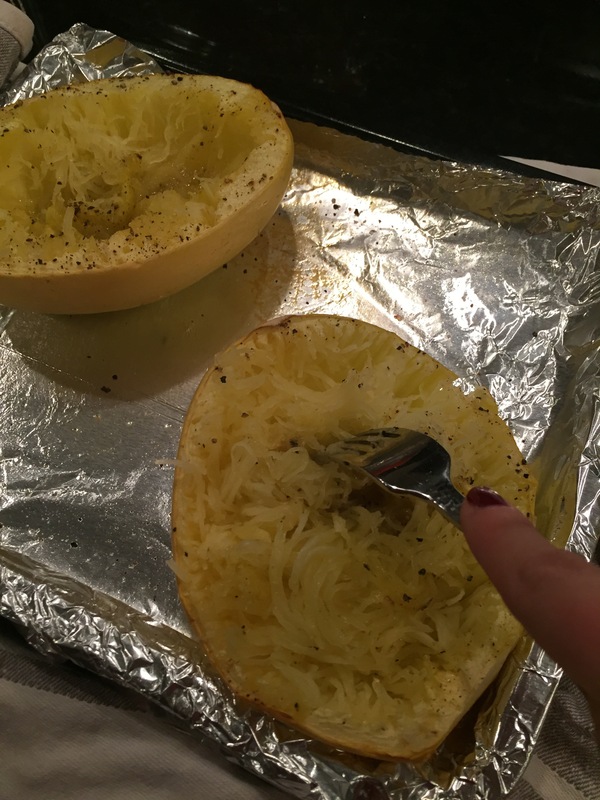 Cut spaghetti squash in half and place on a baking tray. I always line my trays on foil for super easy clean up. Sprinkle with salt, pepper and drizzle on some olive oil. 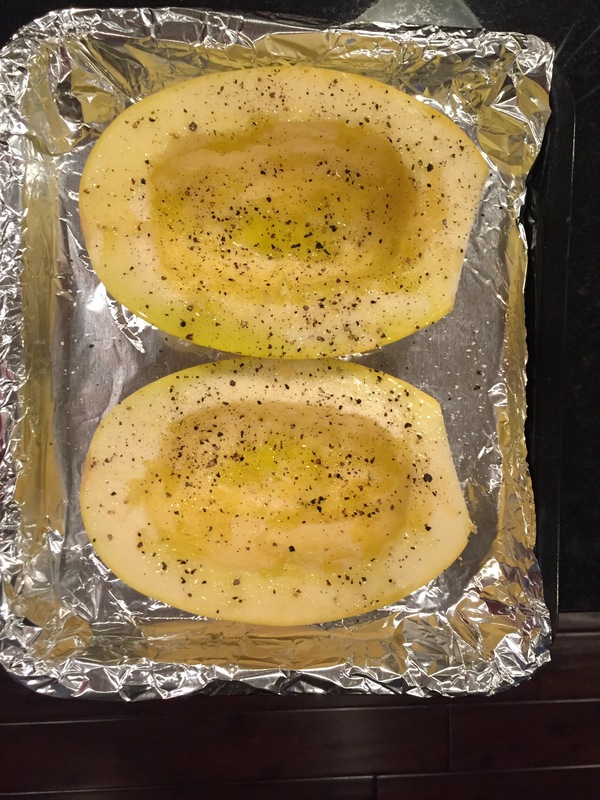 Bake until squash easily shreds – usually about 30-40 min depending on size. Remove the squash from oven and let it cool for a few before shred with a fork. Scoop your squash noodles into bowl and top with sauce and meatballs! Slice up some fresh basil and dig in! If I had Parmesan cheese I would have topped the dish with it! There are so many variations to this dish! On a weekend with more time I’d wip up my own pasta sauce and slow cook the meatballs for a few hours. There are so many great pre-made meatballs sold these days too. Trader Joe’s frozen turkey metballs could easily be thrown into the sauce!